Model CGE – The proposed dynamic computable general equilibrium model (CGE) which is the core of a comprehensive and consistent analytical toolkit, is accompanied by a package of sectoral partial equilibrium models. The construction of a dynamic macroeconomic model will, on the one hand, allow changes in the economic conditions to be reflected in successive periods of a forecast– enabling a more accurate assessment of the effects of implemented policies and measures – and, on the other hand, it will make it possible to link a macroeconomic model to sectoral models, contributing to improving the quality and reliability of analyses made using an integrated model-based toolkit. More details will be provided in model documentation. Energy sector model – Power and heat generation, as areas responsible for a substantial part of the emissions of greenhouse gases and other air pollutants, are a very important part of the economy from the point of the climate and environmental protection issues. Therefore, in order toensure a reliable assessment of the climate-related and environmental effects of the policies pursued, it is crucial to adequately precisely model the energy sector. 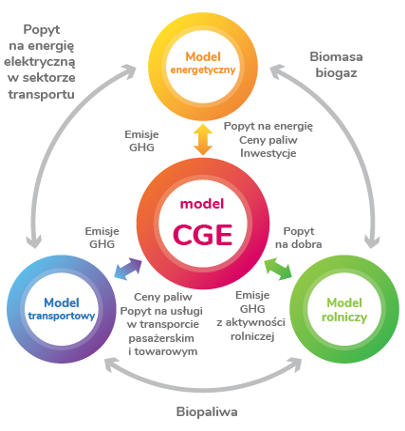 In the CGE model, the energy sector is addressed in a simplified manner – through nested functions of production in which energy can be substituted for by a combination of capital and labour and at a lower level, by fuel substitution. At this level of generality, it is impossible to map in sufficient detail the operation of the energy sector. In consequence, it is necessary to create a tool which would enable more detailed analyses of the energy sector, taking into account its specificity, and, as a target, to link it to the CGE model. To this end, the creation of an optimisation model is planned. It will cover the supply and demand sides of the energy sector, enabling detailed analyses of the effects of the climate and energy policies pursued. From the point of view of the supply side, the model will address the issues of power security and sufficiency, its transmission and storage, the operation of unstable renewable sources, conventional and nuclear generators, cross-border electricity exchange, district heating generation (including cogeneration), the capabilities and directions of fuel imports. Transport sector model – Road transport is now one of the major sources of the emissions of greenhouse gases and dust pollutants, including oxides of nitrogen. Its role is particularly important as these pollutants have a large impact on the air quality in cities, as a result of which they affect a substantial part of their population. At present, the government and territorial administration do not have tools which would ensure a reliable assessment of the strategies implemented in the area of transport, in a manner consistent with other sectors of the economy. The demand for transport activity depends on the condition of the economy; therefore, naturally, the results of a macroeconomic model can consist aninput to the transport model. In turn, activities carried out in the transport sector will affect the rate of economic growth and the optimum solutions, e.g. in the energy sector. Similarly, the electricity generation mix will affect the costs and emission factors of solutions applied in transport. Therefore, a correct assessment of the future changes in transport and the choice of the optimum directions of actions in this area require both precise modelling of the transport sector itselfand linkages between its operation and other areas. For this reason, as a target, the transport model will be integrated with the other models, to produce a joint calculation package which would integrate policies created in different areas, enabling a joint assessment of the emissions-related and environmental effects of the actions taken. Agriculture sector model – Agriculture is one of the sectors which generate significant level of greenhouse gas emissions. They are related to livestock breeding (methane emissions) and plant cultivation, including the use of fertilisers. Moreover, the sequestration capacity offered by forest complexes, biomass production for energy generation purposes, the use of agricultural waste for energy generation purposes and the production of biofuels are important from the point of view of the national GHG emission balance. It is important to consider these elements not only in order to balance greenhouse gas emissions at the national level. In addition, it is important for assessing the potential for the future energy production from renewable sources. Therefore, the agriculture sector will be affected not only by agricultural policies, but also by elements of climate and other policies pursued in the areas of energy and transport. As a target, the agriculture model will be linked to the general equilibrium model and the other sectoral models, enabling an assessment of the costs and effects of national and European policies on the agriculture sector in the context of Poland’s economy as a whole.